I never used to bring a hostess gift when I was invited somewhere until I saw so many lovely gifts people posted on their blogs. I just wasn’t a custom when I grew up or at least not one I was aware of. I feel so grown up when I bring something with me. 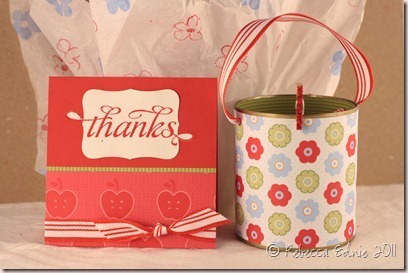 But now I don’t know, do I still send a thank you card when I give a hostess gift and card? Or do I save the card for after? Hmm.. if you know, please leave me a comment and fill me in! I covered a little can with DP and added a cute little handle. 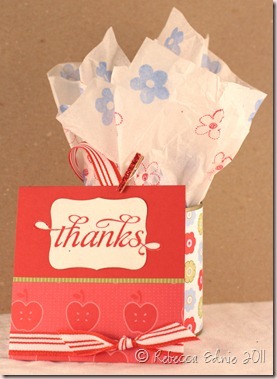 You can see the card I made too and behind is custom tissue paper to wrap the gift. I put a shower gel and purse-sized hand cleaner inside. I added Scor-Tape and glitter to the mini clothes pin to hold the card on to the can. I hate using envelopes when I am hand-delivering a card. Seems so wasteful! Here is how it looks put together! I hope she likes it! She will love this gift. if I make something and bring it somewhere people usually appreciate the gesture. I write thank you notes for dinner parties or other gatherings that are not my usual “family” events. For stamping events, I bring something and that is it..Normally no need for a note. I like to send cards to my crafty friends throughout the year anyway. Hmm, I don't know the exact etiquette, but I would say take the gift without a card and then send the card after. At least, that is what I always do 🙂 Love your gift and card – very cute!